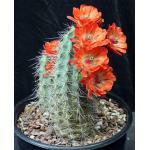 This spiky species is from Angola and Zambia. The plants consist of upright, cylindrical leaves that are banded on a slightly roughened surface with a medium-to-dark green color and white, and faintly yellow segments. The tips are sharp. These plants offset via underground stolons, like many Sansevieria. 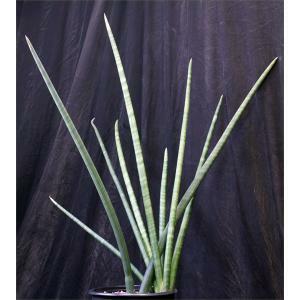 The flowers are white and slightly larger than most species in the genus Sansevieria. The flowers are produced on a relatively tall inflorescence and are generally a dirty white. These plants are rooted offsets in 3-gallon pots.